Quick note, my cell is an iphone so I’ve only been testing apps on the apple market place. I will make note if that app is not available on android though. 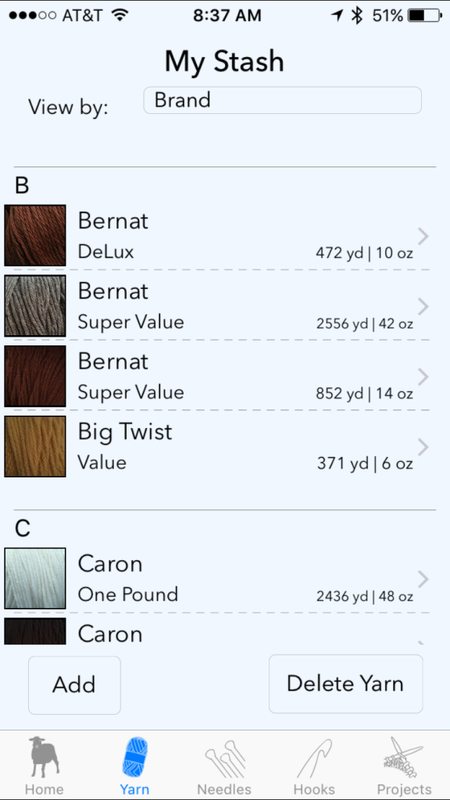 As with most apps available, this one is designed for knitters, with add on options for crocheters….how kind. 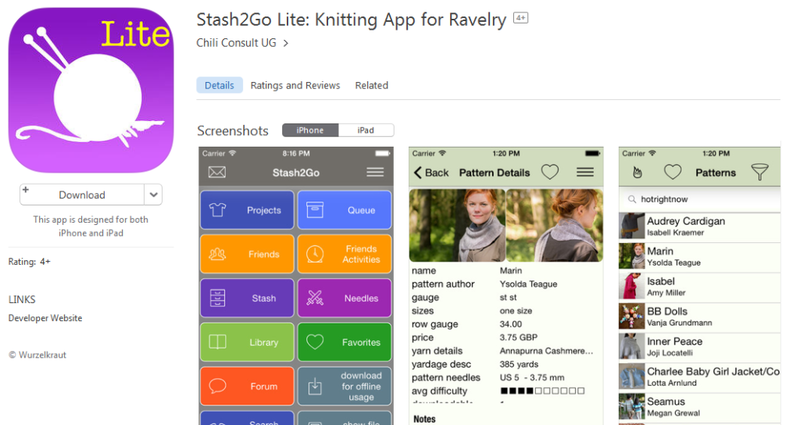 While this app seemed to have it all for the pictures (stash info, current projects, even linking to a ravelry account) it does not work. Got it to open and it would continue to freeze anytime I tried to use it. I don’t know if they just haven’t bothered updating it or why it does this but it just would not work. For those on android though, the reviews says good things about that version (And it’s free!) so it’s worth the download and test at least. 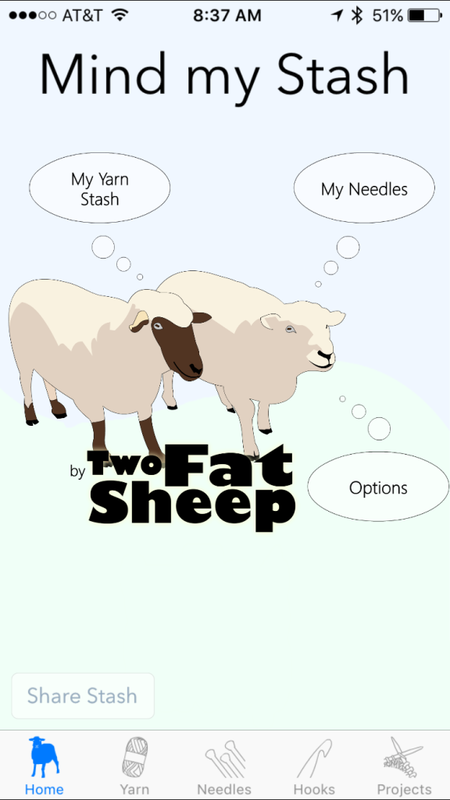 This is quite literally the only other program available on the iphone app store for keeping track of your yarn stash. All the others that may even seem like it…nay. They are just pattern collections, or allow you to access ravelry patterns. Which is all fine and good but….not a yarn stash minder. This one does cost $3 but it does a decent job at what it set out to do. Keep track of your yarn. I’m still fiddling with how I want the info displayed as some fields aren’t intuitive (should name be the color name? or should it be the yarn style name when a color field exists farther down? ), but overall this does the minimum of what I want. Lets me put in how much yarn I have in storage so I know what I’m working from or have to pull when the current skein runs out. 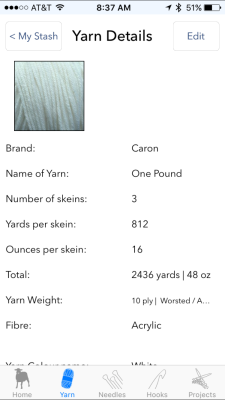 It’s easy to toggle between metric or imperial info and even does the math for what the total yardage/oz you have on hand. I also like that it let me take my own pictures of the yarn as well so I could put them under whatever light I need to make the image look as close as possible to the in life color. Once you’ve added a certain brand name/yarn fiber in that it didn’t have before it will remember it, and you can even go into the settings and delete some of the pre-loaded ones that don’t exist in your area. I also like that I can keep track of the hooks (or needles) I own and that it doesn’t assume you only knit or crochet; it allows info for both. My complaints are fairly minor. I don’t like that the scroll down menu you see when you select your stash doesn’t have the color name listed. 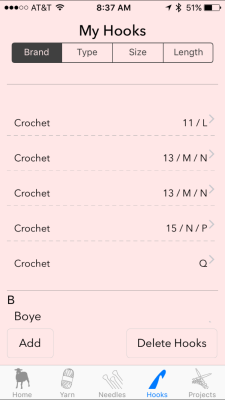 This could be a mistake on part by filling in fields wrong (meaning they want the color listed under color name and yarn name) but to me it just seems like a personal preference thing. I’ll likely make a fix of it on my own in how I fill out my fields. I also wish I had a better way to say I have a yarn of that color in use while having x amount in storage. All minor complaints though.